Mechanism Display. The far left-hand panel shows the mechanism. This is a simulated display of the mechanism that draws the images. The display consists of two main wheels that rotate. Depending on the mode of operation, it can also have two two secondary wheels that rotate inside the main wheels. The secondary wheels rotate like "planetary gears" inside the main wheels. Finally, a set of "Arms' is attached to the wheels. The arms can be in a Pantograph or T-Bar configuration. As the the wheels turn, the mechanism moves through a complex motion. The position of the end of the arms determines where the program draws the lines of the pattern. Inside each wheel is a circle with an adjustable radius. 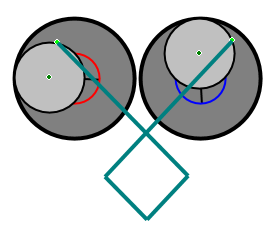 A point on the circle is used as an attachment point the arms for the secondary wheels. As the radius is adjusted, the relationship between all the elements in the mechanism changes and different patterns are drawn when the wheels turn.